Get ready to set sail on a wild East Coast adventure as you and your group embark on a 3-Day fun-filled getaway to Daytona Beach’s sandy shores and speedy racetracks! 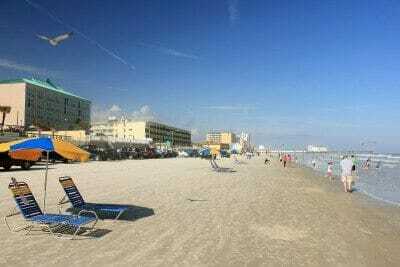 Take in the natural setting and historical importance of the Daytona Beach area as you travel along the long sandy beaches and learn about why they call Daytona Beach the best beach in the nation. Cultural insights as well as as much beachfront fun as you can handle await you as you splash around Daytona Beach Lagoon, multiple boardwalks and piers, and countless beaches. Even let loose like a NASCAR driver with the exciting Daytona 500 experience, ensuring your group will the ultimate Daytona Beach experience! Ponce Inlet - ‘The nation’s best beach’ is located just south of Daytona Beach and is home to the best waves and best surfing on the East Coast. This area on the tip of the peninsula was stumbled upon my Juan Ponce De Leon in 1513 and has since served as an important historical, cultural, and entertainment hub for Florida. The Inlet houses the tallest lighthouse in Florida, a marine science center, boardwalks, observation towers, and several nature trails. Water sports are highly practiced on this beach, with everything from extreme surfing lessons, parasailing 600-1200 feet above the water, or stand-up paddling the Atlantic are all ready and waiting for your group to explore. There are also several eco-tours and boating outings available, as well as the Inlet Harbor Restaurant, Marina, and Gift Shop. The fresh seafood and daily community events at the Inlet Marina add to the experience as your group starts their day off right at Ponce Inlet. Ponce De Leon Inlet Lighthouse - Your next stop will bring your group to an integral part of the Ponce Inlet, the Ponce De Leon Inlet Lighthouse. Known to be the tallest lighthouse in Florida and the second tallest lighthouse in the nation, Ponce De Leon Inlet Lighthouse will allow your group to step back in time and learn about the rich cultural background of this area and lighthouse as well as take in the best views the beach offers. Standing at an astounding 175 feet tall and boasting 203 steps, this lighthouse is also known as the best preserved and most authentic historic light station in the nation, with 170,000 guests annually climbing the steps to this National Historic Landmark. Group tours of the lighthouse will allow you to take in the unique Daytona Beach history, as well as the history of U.S. lighthouse service. Save plenty of space on your camera for the observation deck views, allowing your group to see Daytona Beach, the Inlet, and the Atlantic all at once! Marine Science Center - Make sure your group saves plenty of time for exploration on this next stop at the Marine Science Center on the Inlet. This ‘environmental odyssey’ will allow you to get up-close and personal with some of the marine locals and learn more about their behavior and habitat. Mainly dedicated to sea turtle rehabilitation, this facility is home to seven full turtle hospital pools all of which you can look over from the Turtle Terrace. The Marine Science Center has seen more than 17,000 rehabilitated turtles swim in and out of their pools, as well as 4,500 seabirds that they have rehabilitated. While walking through the center, your group has the opportunity to visit a living reef aquarium with 300 year old coral, a mangrove estuary, and interactive exhibits such as one famously featuring a massive humpback whale skull. One of the most interesting features of this stop is the stingray touch pool, which isn’t meant just for kids. Your whole group will love the opportunity to touch cownose and Atlantic stingrays in this 13 foot long 1,400 gallon tank, as well as many other native marine species that are surprisingly friendly. Museum of Arts and Sciences - The Museum of Arts and Sciences, commonly known as MoAS, will end your group’s day in Daytona Beach perfectly with a relaxing educational experience. MoAS is the premier art, science, and history museum in the central Florida area and is also the area’s largest museum. Nationally accredited by the American Alliance of Museums as well as being an affiliate of the Smithsonian Institute, this museum offers information on a wide range of interests hosting over 30,000 permanent objects. Located on a 90-acre Floridian nature preserve, MoAS houses several facets of education including the Cuban Foundation Fine and Folk Arts Museum which holds the largest collection of Cuban art outside of Cuba. Your group can also explore American or European Fine and Decorative Arts, Pre-Colombian and African Artifacts, Pleistocene fossils, an impressive outdoor sculpture garden, and learn about Florida and regional natural history. The complex boasts a 40 foot domed planetarium and a museum dedicated to the history and influence of Coca-Cola as well. Make sure your group put on their walking shoes to ensure you get to explore it all! Daytona Lagoon Water Park - Get ready for an exciting day full of nothing but sun, sand, and fun as you start your second day of Daytona adventures at Daytona Lagoon Water Park. Daytona Beach’s premiere family entertainment center offers more fun activities than anywhere else in Daytona. Over a million gallons of water await you in the park offering tons of freshwater fun activities such as Blackbeard’s Revenge, a 62-foot slide, Adventure Mountain, the fastest racer slides at the park, Pelican’s Drift lazy river, or the comfortably spacey yet completely realistic wave pool. If the weather isn’t up to par for any of those adventures, your group can find their inner kids at the extremely large on-site arcade, two 9-hole mini golf courses snaking through the waterpark, fast-paced grand prix go kart course, or 13,000 foot laser tag facility. When you’re done working up an appetite (which you undoubtedly will with so much to do) your group can stop at Paradise Grill or Wave Grill for some fresh lunch or head over to the Crusoe’s Tiki Bar to cool off with some refreshing frozen (virgin) cocktails. Daytona Beach Pier - Your day of fun Daytona excitement isn’t over just yet as your group makes its way down to the Daytona Beach Boardwalk and Main Street Pier. The ultimate boardwalk experience awaits you on East Coast’s ultimate beach destination, with opportunities to do whatever you desire. Offering indoor and outdoor rides, a large arcade, go-karts, as well as unique game and shopping experiences, the boardwalk and pier has everyone in your group covered. The Main Street Pier is an impressive 88-years old and is the longest on the East Coast, reaching a little over 600 feet over the Atlantic. Take advantage of the 9-minute ride on the famous Sky Lift for a better view or the 180-foot journey up to the top of the Space Needle. There are also beach sport opportunities as well as a fountain park, sweets shop, and one of the first Joe’s Crab Shacks which allows a rooftop view of the pier during your dinner. Catch a Daytona Beach sunset as you lay in the sand, ride to the top of the Ferris wheel, or have delicious dessert at Joe’s as you end your day at this premiere boardwalk and pier. Daytona 500 Experience - Get ready for some high-speed adventure as your group gets the once in a lifetime opportunity to experience the Daytona International Speedway like the racers do with the Daytona 500 Experience! This one hour speedway tour lets visitors see never before seen parts of the track such as the Daytona 500 Club, Sprint Tower, and Sprint Cup Garage, as well as the more visited locations like the Gatorade Victory Lane and Sprint Fan Zone. This experience was created to let fans have a more in-depth view of the inner workings of the Daytona race world and includes a seasonal Richard Petty Driving Experience, Chevy 16-second pit stop challenge, and interactive Acceleration Alley features. Though the museum is currently closed until renovations are complete in 2016, guests can still learn plenty of racing facts throughout the tour and facility. Get a chance to dine as close to the track as possible at the Fourth Turn Grill and be sure to pick up a souvenir model car on your way out of this fast-paced true Daytona destination. Beach Street - End your day and Daytona experience at this historic retail area located in the heart of downtown Daytona. This scenic riverfront shopping, dining, and entertainment mecca will give your group the perfect mix of local history and culture as well as fun and relaxation. These locally owned shops and services provide great shopping opportunities, perfect for looking for that essential Daytona Beach souvenir. There are also multiple chances to enjoy great food with everything ranging from fresh and local seafood or sushi to authentic Italian or French cuisine. You can even stop by the Angell and Phelps Chocolate Factory to fill that sweet tooth craving! On the opposite side, be sure to stop at Florida’s oldest farmers market, if you happen to be here on a Saturday, with an impressive spread of local delicacies. Beach Street offers opportunities to see the Daytona Tortugas play on the historic waterfront Jackie Robinson Ballpark, as well as visit the Halifax History Museum for local history and culture lessons. You can even just enjoy your night at the Halifax Harbor Marina for relaxing water activities. Between the museums, exhibits, outdoor festivals, aquatic activities, cafes, theaters, and performing arts centers (Daytona State College), your group will have a fantastically hard time deciding how to end their perfect getaway to Daytona Beach!